These are the only buildings that survive from the original complex of buildings of Wheathampsteadbury Manor. It appears that they were originally built by Westminster Abbey in the 15th century as 'Hall, Chambers and Gatehouse' to the 13th century moated Wheathampsteadbury Manor House. Traces of the moat are still visible to the west of the house. In the mid-18th century, the buildings were upgraded to become 'The Manor House'. Later still, in 1879, they became a Victorian farmhouse and then farmworkers' cottages attached to Bury Farm which stood on the hillside to the south which is now covered with housing. Westminster Abbey administered the manorial estate until shortly after the Second World War when it was sold off for development. 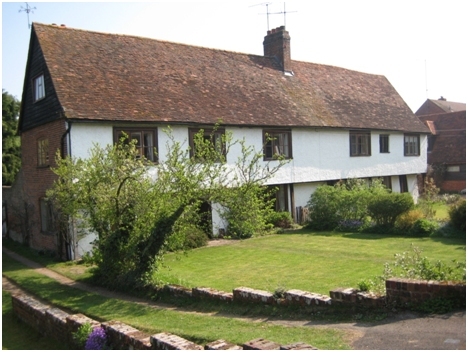 Bury Farm Cottages were bought in 1953 by private owners who have restored the building both inside and out. For detailed information on The Manor of Wheathampstead download the booklet produced by David and Ann Godfrey-Evans here (4Mb).